Improve parenting skills with Your Journey Together (YJT), a research-based, trauma-informed curriculum that builds resilience in vulnerable families. What is Your Journey Together? Your Journey Together (YJT) is a strength-based curriculum designed to promote the social and emotional well-being and resilience of vulnerable children and their families. The YJT curriculum focuses on empowering parents to promote safe, trusting and healing environments—all key elements of a trauma-sensitive program. While YJT is designed for families with young children including infants, toddlers and preschoolers, many of the concepts apply to families with children of all ages. The goal of YJT is to provide parents and guardians with the knowledge and skills that promote resilience, and help family members better cope with life’s challenges and reach their full potential. Your Journey Together shows parents how to use ordinary, everyday routines, activities and interactions as resilience-building opportunities. 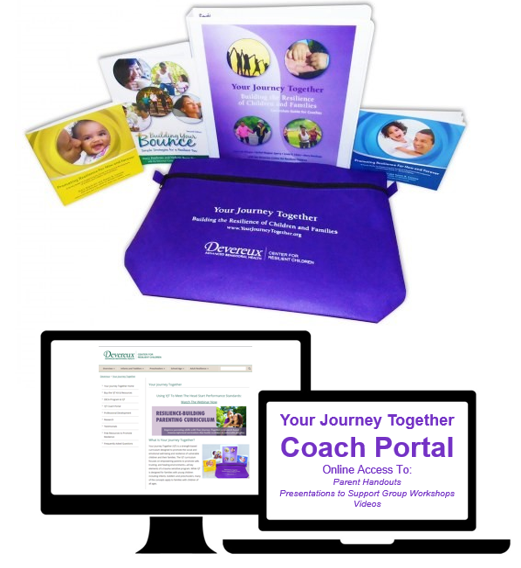 Your Journey Together can help you meet your Head Start Performance Standards! Review the different in-person and online professional development opportunities we offer surrounding the YJT resources. All of our resources are based on extensive research. Read testimonials from professionals who have experienced YJT. View a PDF with sample pages from YJT. View a PDF with information about YJT as a trauma-sensitive tool. Read a press release about the YJT curriculum and associated national training events. Watch a recorded webinar about the use of YJT in supporting vulnerable children and families. View a PDF with information about YJT’s alignment with the Center for the Study of Social Policy’s Strengthening Families Initiative. Read a published article on YJT.